Here in Australia, poppies aren't well-known as a cut flower. We introduced the Poppy Garden to our range about four years ago. Many recipients are surprised when their Poppy Garden arrives with just a few open heads, but the joy is in watching each whimsical poppy head open one at time until the last petals fall. Here, you can watch the way Sarah arranges the stems so they look like they've grown wild in a garden, the open flowers are added last in between the closed buds. The moss pressed into the base of the garden is the final addition which really completes the unkempt garden look. 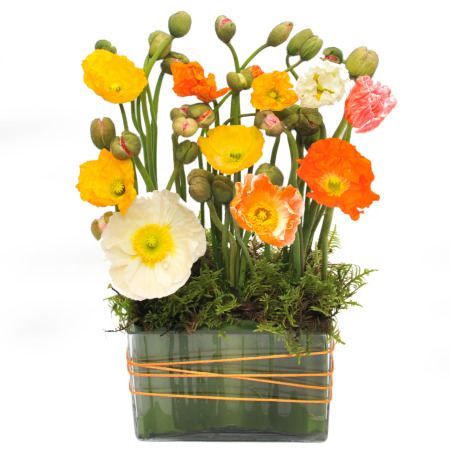 Poppies are also delightful as a single stem or in a small group in an interesting jar or vase wrapped with twine. I find the less-structured the stem (as opposed to the harsh symmetry of iris and lily stems) the better for casual clumping for the windowsill. Poppies remind me of summer fields, the crepe-paper-like crinkled petals translucent and light-filled. A Poppy Garden in my windowsill, whimsical and lovely.